Abby’s homework early in the year was dominated by mathematics, but lately Bell Elementary has been focusing increasingly on reading and writing. This offers us an opportunity to observe a concrete, practical application of the liberal arts side of public education, as Abby harnesses painstakingly-crafted, threatening notes taped to toys in a well-calculated attempt to exert her Sith-leaning will over Jackson. The dark side is indeed strong in Abby; it’s just too bad Jackson doesn’t read. 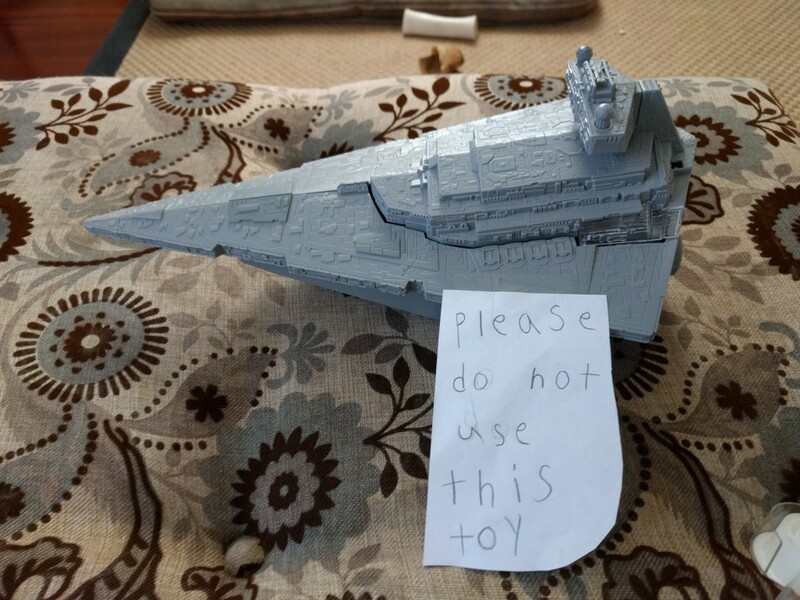 Jackson simply removed this pesky note from Imperial star destroyer and retaped it as a warning on the paisley tuffet. The literate side of the force may be powerful, but never… ever underestimate the unyielding, blissful ignorance of the illiterate side of the force. Touch not, foolish brother… touch not.